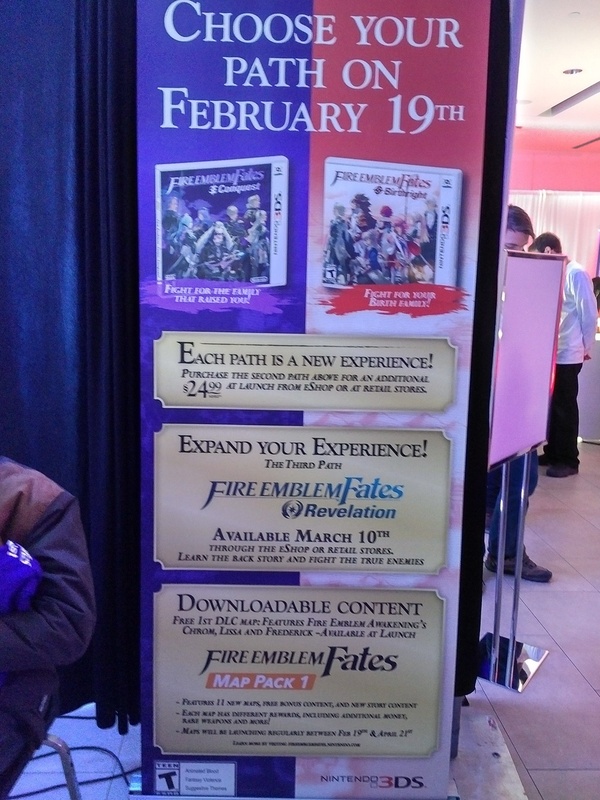 Nintendo Canada gave fans and media a special advance look at the upcoming Fire Emblem Fates games last week. Featuring both side of the new game, participants were invited to choose their fate and side with either the Kingdom of Hoshido or the Kingdom of Nohr. If you haven't heard the story of the game, you are an heir of the Hoshido family, taken and raised by the royal family of Nohr. Your choice: stay with the Nohrians and fight to change the misguided kingdom from the inside, or go back to your birth family and fight Nohr, but with a family that are strangers to you. On display were replica Falchions and banners for each side, and pedestals with multiple 3DS units loaded with the game. I chose the Hoshido side for my demo (aka Birthright), and was handed a New 3DS XL with the game at Chapter 13. My demo rep walked me through some of the new elements of Fire Emblem Fates, and wisely let me know that I could skip the cut scenes if I wanted to avoid spoilers. From what I saw in the demo, it really feels like more Fire Emblem, which is a good thing. The battle animations are slicker in this version, zooming in from the above angle down to the field level. Also, perhaps most importantly, the character models now have feet. Cut scenes are well done as always, but disappointingly there is no Japanese audio option this time around, unlike FE: Awakening. This will be on my list for 2017 once our No Buy 2016 challenge is over, that's for sure! Fire Emblem: Birthright and Conquest release on February 19th, 2016. Posted on February 16, 2016 by Eugene Huo and filed under News.